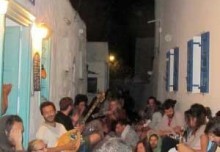 Amorgos has nearly 1900 residents. Most live either in the main town Chora in the mountains or in the ports or Aegiali Katapola. The inhabitants of the latter two villages hate each other cordially, between them is a red-hot competition that just like to have to spice up everyday life on a small island in the sea. We stay in Aegiali as the better of the two. The surroundings are beautiful and the village atmosphere is more relaxed than in Katapola, whose street space was dominated by German pensioners, like in Mallorca. Aegiali actually consists of three small villages around the valley: Aegiali waterfront with Potamos and Tholaria flanking the mountain slopes. One evening we went to the tavern Thalassino Oniro in Tholaria for a meal with view. It was our landlord Mihalis who recommended their friends Yannis and Sophia’s taverna up at the beautiful church in Tholaria.The fish Yannis serves is mostly caught by himself – so we decided for the lobster pasta on the menue. It was impossible to get this tonight, but I fell head over heels for the promise of a grilled black tail (a kind of Sea Bream). Until I got the peppers stuffed with rice and a warm salad of green amaranth, which is a spinach-like leaf vegetable that is harvested. My husband’s long-cooked goat meat was so tender that the meat almost fell apart and the children gotb great minced lamb meatballs. When food was eaten and the coffee was finished, Yannis came out with a little homemade liqueur. And so we sat there on the terrace during sunset across from the church, the priest took his morning coffee and a donkey trotted past the stairs on the way home. Yannis also told me how he makes his Fava, the traditional paste with yellow peas, it should not be mixed up with the fava beans as Hannibal Lecter hated. It is believed that the mess was originally made of beans and the term therefore persisted even after they have been replaced by the simpler small yellow peas. On Thalassino Oniro fava was served lukewarm, directly from the pan with olive oil curled on top, like hummus, the consistency should not be destroyed by oil. accessories as lemon and sliced red onion should be mixed by the the guest itself. At home I tried to cook fava with Swedish yellow peas. The Swedish fava became paler in color but the taste is in amazingly like the original. Cooking time was extended as the Swedish species are larger. They are also slightly sweeter in taste. The recipe is very easy and differs somewhat from Alexandra Pascalidou’s recipe in his fine Greek cookbook. Cheap and good Greek bondmat of yellow peas – Cyclades alternatuive to pasta. Can be eaten hot or cold. The usual accessories are thin-sliced red onion and lemon, but the winter can favan also served with fried pork. Try also a Swedish variant of rapeseed oil, chives and sliced dark rye bread. Olive oil of good quality. Soak the peas for about twelve hours. Boil them with water, no salt! Peel and quarter an onion and let it cook with. Lower temperature and simmer the peas for 40-45 minutes. Skim off with perforated ladle. Blend the peas with a stick blender to a smooth move. Serve warm or chilled with curled olive oil, lemon slices and finely shredded red onion as an appetizer or snack. Paul Delahunt-Rimmer August 6, 2010	Log in to reply. Sorry Erwin, you are not getting away with this one. 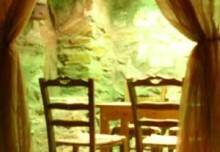 I am sitting in what used to be, and is still considered to be, the capital of Aegiali; Langada. If it falls down I will drag myself from the rubble and correct this comment. erwin August 6, 2010	Log in to reply.